You know you should quit smoking, chewing, or vaping tobacco. We know that it's easier said than done. Pima County Health Department's Tobacco Prevention and Cessation Team is here to help you! Are you ready to quit tobacco (including e-cigarettes)? We can help! Tobacco is the leading cause of preventable death in the United States. By quitting, you will be able to take the next step towards a healthier YOU. After only 12 hours of not smoking, your body's oxygen level normalizes. 7,000 chemicals have been found in secondhand smoke, 70 of those are known to cause cancer. The average cost of a pack of cigarettes in Arizona is $8.05. That's over $240 each month for a pack-day habit. There are over 500 e-cigarette brands and more than 7,700 e-liquid flavors targeted toward youth and young adults. Join the hundreds of people who are trying to quit tobacco and nicotine products EVERY DAY. Don't get discouraged, it takes an average of 8-11 attempts to completely abstain from tobacco. Every try counts. Call us at (520) 724-7904 and we can connect you with FREE resources to quit. In December 2018, the U.S. Surgeon General issued an advisory on e-cigarette use among youth and teens. You can read the advisory here. The Pima County Health Department is working diligently to update our materials to include the dangers of e-cigarettes for youth. The most important factor in PREVENTING young people from using tobacco products is having a parent or caring adult talk with them about the risks. Learn how to talk to your children about tobacco here. Click the tabs below to learn more about how we can help you prevent youth from taking up the tobacco and nicotine habit! Take a STAND with us! 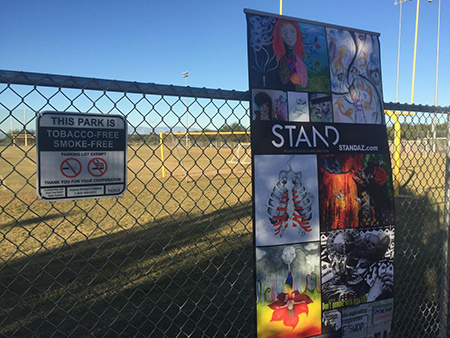 Students Taking a New Direction (STAND) is Arizona’s anti-tobacco youth coalition effort for Arizona teens. These youth coalitions aim to reduce youth tobacco initiation and exposure to secondhand smoke through community involvement, peer education and advocating for environmental changes. The youth coalitions partner with adult leaders at their site and work closely in conjunction with them for support towards the coalition's goal. Pima County Health Department mentors and supports STAND coalitions by providing technical guidance, including trainings, equipment, and other support. If you would like to learn more about or be a part of a grassroots movement with STAND, please contact us at 520-724-7904 or visit STAND online. Please complete this 2-3 minute survey after any presentation or special activity/event. When teens have easier access to tobacco, more of them will get addicted. Counter Strike is about teenagers making a difference in their community by working with local law enforcement to identify stores that sell tobacco to minors. Since 2002 the Attorney General’s Office has partnered with the Arizona Department of Health Services to develop and maintain the Counter Strike program. Youth volunteers in Pima County, accompanied by special investigators from the Attorney General’s Office, enter tobacco retailers and attempt to purchase tobacco products. If the retailer sells a tobacco product to the volunteer, they may be given a citation for furnishing tobacco to a minor. If the retailer refuses to sell the tobacco product to the volunteer, they are notified of the inspection and congratulated for their vigilance in keeping tobacco away from minors. The program’s goal is to reduce youth access to tobacco in retail outlets by systematically monitoring retailer compliance with state laws which prohibit the sale of tobacco products to minors. The program also serves to coordinate and encourage local enforcement with those laws. Over 23,000 retail inspections have been performed since the program’s inception. Blackout Tobacco - designed to coincide with the Great American Smoke Out (GASO), we encourage community members who smoke to give it up for one day - the 3rd Thursday in November - and explore resources for quitting for good! REAL DEAL on Vaping - this campaign was created in response to the rapid uptake of e-cigarette use and vaping by teens and youth. Many people are not aware what is in vapes and what those chemicals can do to their health, especially during the teen years.